Do you just jump into a workout and then end up with sore body parts the next morning? Strong and sore does not sound like a very good combination, whatever the motivational quotes have to say about it. But, wait a minute, are you sure you are doing it right and not forgetting your warm-up exercises? Okay, here is a simpler way of explaining this, are you waking your muscles from sleep before hurtling them towards strength-training or a spot of cardio? Does any of this make sense to you? Strength is important, it is the foundation of fitness, but before the strength comes the mobility part. You pick up a dumbbell and move it for 15 repetitions, but before all of it, you need to increase the circulation of your body so that your hand becomes nimble and warmed-up enough to lift it. Are you still wondering whether you need to waste precious minutes on a warm-up routine if you’re already pressed for time? Don’t worry, we will help you zero in a few warm up routines which can be done in no time at all! Before you even think of skipping a proper warm-up and cool down, remember one thing; warm-ups give that support and stability to the body before and after an intense workout session. The main reason why you should warm-up is to gradually increase the intensity of your heart rate. The increase in heart rate can help increase your body temperature and help the blood flow reach every organ of your body. This is one way of oxygenating your muscles, and it also acts as preparation for the more intensive workouts to come. Once your body is properly warmed up and ready, the rest of the workout will prove to be a cake-walk. Okay well, not entirely true, but then you will be able to stretch your body more and find a greater range of motion, so it is definitely going to be easier! It will sound even better when you will know that it will make your muscles ready for the oncoming onslaught! So it is going to be Hello muscles! Are we good now? Of course they are, and that’s the very reason you will be able to slash down the risk of potential injuries. 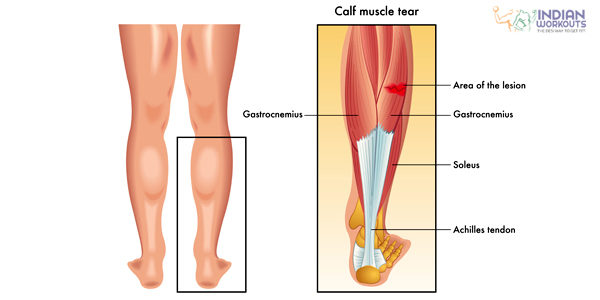 Let’s get this straight, minimum muscle tears = fewer chances of injuries. What’s more? The elasticity and flexibility of the tendons and the ligaments also improve drastically, because your joints are well lubricated with a synovial fluid which is released when you warm-up. For How Long Should you warm up? Nowadays, workouts are no longer long drawn out intermittently till you bore yourself to sleep, they are short, snazzy and get your heart rate really high! So warm-ups do not have to be extra-long too. A good 5 to 10 minutes is all it takes! Of course, it also depends on your physical needs. If you have been up and about and pretty much active, then your body is already somewhat warmed up, then squeezing in 5 minutes for a warm up can charge you up and oxygenate your muscles. However, if you have hit the lazy button and have been chilling on a couch, then take 10 minutes more to properly warm up. By warming up you mean to warm up the major muscles of your body, namely the hips, glutes, thighs, calves, chest, and shoulders. A simple 5 min workout can target all of these muscles. All you have to do is marchin place and also swing your arms back and forth. Also, remember to make your warm up exercise a bit more interesting by making it more varied, high knees, jump rope (even without the rope) work big time. Just to make it even more effective, add some arm movements like arm circles or marching or jogging in place. Believe us, it works! For endurance or proper cardio routines, you can try dynamic stretching, which hits the active range of motion; movements that mimic the movements you are going to do in your workout. So, when you finally do the exercises, you will be able to perform much better. 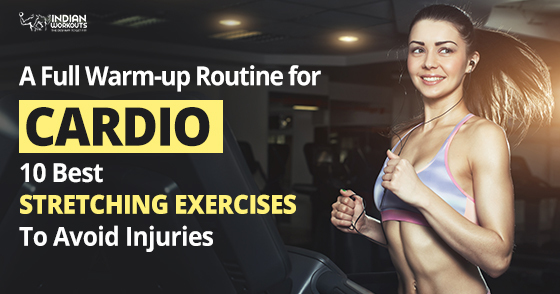 Now that you know that your workout routine is never complete without a warm-up exercise, you have to focus on the ones which can warm up and loosen the body, and also stretch it the right way. These warm-up exercise are just what you need the next time you tie up your sneakers to hit the gym. A perfect example to instil upper body strength, inch-worms help stretch the lowerback and hamstrings with equal measure. Perform this exercise as part of your preparing the body for a more intensive workout. Stand with your feet shoulder-width apart and keep your hands right on the ground, placed before your toes. Bend your knees slightly so as not to get a stretch on your hamstrings, but to strengthen your upper body. With steps, walk your hands out away from your body, balancing your weight onto them. Get2 feet or soaway before you inch your hands back toward your feet. Repeat. Glute bridges are excellent for hip mobility and they really warm up your body before you jump into an invigorating and sweaty session at the gym. Lie down with your face up on the floor, knees bent and feet plantedon the ground. Keep your arms on either side and your palms down. Lift your hips right off the ground until your knees, hips, and shoulders are aligned in a straight line. Tighten your glutes hard and keep your bellybutton drawn in so you don’t tire your back during the exercise. Hold this position for a few seconds before bringing your back down to the floor. The most common areas which are really effective to foam roll on are the ITB, quads, abductors, hamstrings,buttocks, and calves. Place the roller of foam right under the muscle group to be rolled. Ensure your full body weightis on the roller. Gentlypull your body back and forth over the roller with the help of your upper body. Roll at least five times over each muscle group and repeat on the opposite side. These warm up stretches are great for your hips, glutes and hamstrings. Stand tall with your legs straight and arms resting at your sides. Kick one leg straight out in front of you while you try to reach it with the other hand. Return the leg back to the earlier position and repeat it on the other side. These warm-up exercises are a perfect way to activate your abdominals, glutes, quads, hip flexors, and hamstrings. Step forward with your left foot into a lunge position. Ensure that you keep your knee over your left foot; don’t attempt to twist at the knee. Twist your upper body to the left from your torso and reach across your left side with your arms out-stretched. Slowly maneuver your arms to the center and step forward with the opposite foot and twist to the other side. Standing mountain-climbers engage your abdominal muscles, obliques, shoulders, and arms, and not to forget also works your abs, thighs, and glutes,it’s a warm-up workout to reckon with. Raise your right arm right up in the air,and as you use your lower abs, raise your left leg up to bring your knee towards your chest. Reach your arms, as if you are climbing up a mountain. Lower your right arm and get your left leg back to their starting position, raise your left arm overhead and bring your right knee towards your chest. Repeat this alternating movement quickly, all the while maintaining control. Try to move between sides with a hop to make it a little more challenging. Arm swings look easy, but they are not and they give your shoulders a pretty neat workout. It gives your shoulders tone and definition. Stand with your feet shoulder-width apart and then lift both your arms straight out to your sides at shoulder height. Move your arms in a circular motion, keep your palms facing down, drawing a small circle with your fingertips. Give your arms break for a few seconds and then raise them again, this time move them anti-clockwise. The knee circles are a stretching exercise that work on your calves, quads and hamstrings. Don’t forget to add them to your list of warm-up exercises. Stand with your hands together. Let your hands rest on your waist. Start to move your knees in a circular motion. 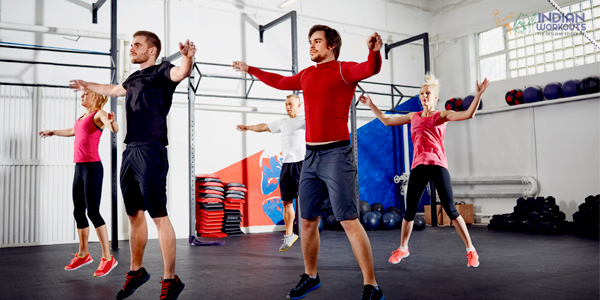 Jumping jacks are warm up exercises primarily used for warming up before a fitness activity. They can also be used as some cardiovascular training. 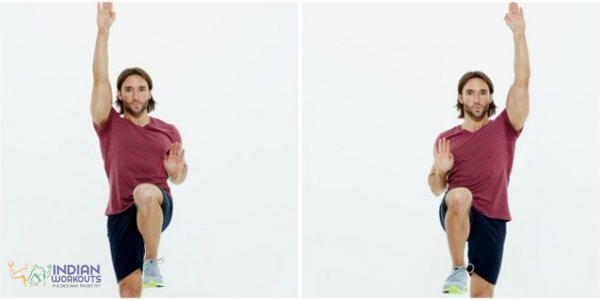 Jump your legs out and simultaneously bring your hands overhead, then jump back to standing. Open your arms out to the sides as you jump with your legs wide. Cross your feet as you bring your legs together while crossing your arms in front of your chest like a cross jack. The Alternating knee hug and ankle grab stretches your hip flexors and quads, and helps relax your glutes. Stand with feet hip widthapart. Hug your left knee to chest with both hands for a count of 2. Repeat on the other side. Take hold of your left ankle and give your quads a nice stretch, raising yourright arm for balance. Focus on pointingyour left knee straight down, so your thigh and hip are in a straight line. Repeat on the other side, then repeat the entire sequence. So, as it turns out, warm-ups are not just important for loosening up your muscles; they also elevate your heart rate and bring about more mobility in your joints. That’s why dynamic warm-ups that require you to maintain fluid movements are much more effective than static stretching, such as touching your toes and holdingthat position for 30 seconds. Have you started working out with determination? If you have, then hopefully you are not forgetting to include your warm-ups. 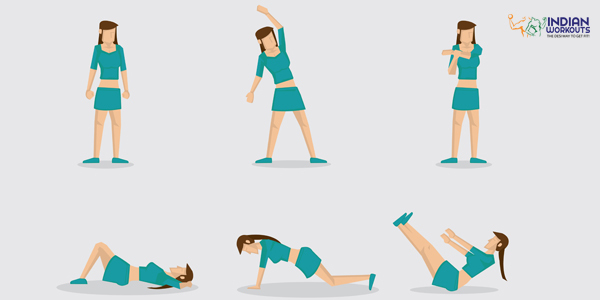 Activate your muscles and switch on to active mode with the above-mentioned warm-up exercises.